Apple Inc. (NASDAQ:AAPL) is a stock worth buying and holding onto according to CNBC analyst and former hedge fund manager Jim Cramer, who expressed some perplexity on CNBC today at the propensity of people to encourage trading in Apple Inc. (NASDAQ:AAPL)’s stock rather than buying it. “I mean, stop trading Apple. Own Apple. It’s been an unbelievable stock. It sells at 16 times earnings. I don’t think Samsung is going to reveal anything that I think is really eye-opening. I do wish that Apple, the thunder had not been stolen for the Apple Wallet, but enough with this trade Apple, where has that gotten you,” Cramer said. Cramer was namely referencing a Pacific Crest report released today which was lukewarm on Apple Inc. (NASDAQ:AAPL)’s prospects, and urged people to cash out on the stock now. Though it currently has them listed with an outperform rating and a $100 price target, the report warned that they may downgrade Apple Inc. (NASDAQ:AAPL) following their September 9 event if they don’t feel the company has any massive profit opportunities on the horizon. While many analysts believe the rumored iWatch will be that opportunity and have anticipated immense sales in the short term for the Apple Inc. (NASDAQ:AAPL) smart watch, the report was not as rosy on the iWatch, feeling it would not be a meaningful profit generator for Apple Inc. (NASDAQ:AAPL) in either the short or medium term. 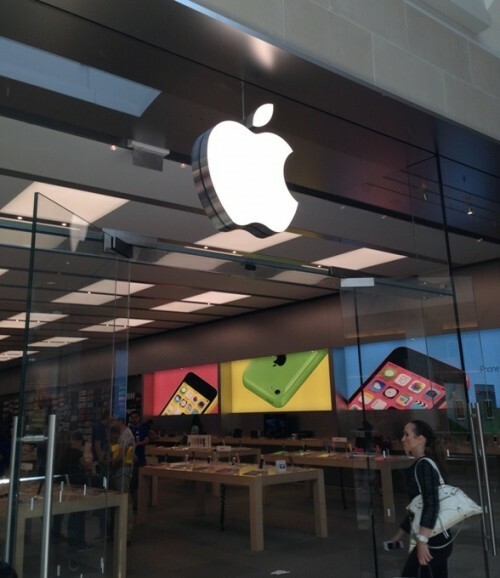 Apple Inc. (NASDAQ:AAPL) entered today at over $103, but has fallen below $100 today in morning trading, seemingly due to two factors: that Pacific Crest report, as well as the unveiling of two new large-screen smartphones by rival Samsung in New York today, just days ahead of the expected unveiling of Apple Inc. (NASDAQ:AAPL)’s own larger-screened iPhone 6 models. The new smartphones from Samsung are the Galaxy Note 4, and Galaxy Note Edge, the latter of which has a wrap-around screen. Apple Inc (AAPL) Jim Cramer NASDAQ:AAPL Samsung Electronics Co. Ltd.